Synopsis: It is 1915. War is being fought on a horrific scale in the trenches of France, but it might as well be a world away from sixteen-year-old Midge Macpherson, at school in England learning to be a young lady. But the war is coming closer: Midge’s brothers are in the army, and her twin, Tim, is listed as ‘missing’ in the devastating defeat of the Anzac forces at Gallipoli. Desperate to do their bit – and avoid the boredom of school and the restrictions of Society – Midge and her friends Ethel and Anne start a canteen in France, caring for the endless flow of wounded soldiers returning from the front. Midge, recruited by the over-stretched ambulance service, is thrust into carnage and scenes of courage she could never have imagined. And when the war is over, all three girls – and their Anzac boys as well – discover that even going ‘home’ can be both strange and wonderful. ‘…rousing stuff, and it hasn’t been watered down. French doesn’t shy away from the nightmarish conditions of trench warfare. Highly readable, scrupulous in its history…an ideal text for schools. My thoughts: It is obvious from the first pages of this book that French has done extensive research. At the beginning of the book there are four maps which show the route of the first Anzac Troops to WWI, the Western Front in France during 1916, The Middle East during WWI and Gallipoli in 1915. I found this book whilst searching through the library catalogue for books by Australian women. 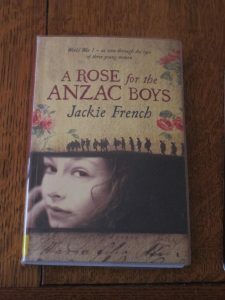 The book opens in the fictional place of Biscuit Creek in 1975 on Anzac Day as one family makes their way to the centre of town in order to take part in the service. Then we head back in time to 1915 and to Miss Hollington’s School for Young Ladies where we are introduced to three friends Midge, Anne and Ethel who are bored at school and decide that they want to try to help with the war effort, so they come up with the idea of opening a canteen in France. The book then traces their experiences in France through explanations of what they are up to, as well as letters to friends and family. The war front is brought to life in this book. I found it interesting to read at the end of the book in French’s own words that she found it a difficult book to finish. I am so glad that she did finish it as it is a beautiful book. At the conclusion of the book she has a section entitled ‘The Forgotten Army’ where she gives some information behind the book. This book is dedicated to all the women who contributed in some way during World War I. They may have been close to the front or they may have been at home knitting socks or making bandages (or many other things). These women have helped make the world what it is today. World War I cost Australia and New Zealand more men than any other war. There were fewer than 5 million people in Australia at the declaration of war, but 300,000 men enlisted. Of those, 60,000 Australian men were killed. And 150,000 to 200,000 more were wounded, gassed or suffered shell shock and other mental problems. New Zealand sent 103,000 troops from a population of just over 1 million – 42 per cent of men of military age. There were 16,697 New Zealanders killed and 47,317 wounded. Australia and New Zealand had the highest casualty and death rates per capita of all countries involved in the war. ANZAC stands for Australian and New Zealand Army Corps. In 1917 the word Anzac meant someone who had fought at Gallipoli, later on it meant any Australian or New Zealander who fought during World War I.
I know that one of my family members was involved with the Gallipoli campaign. However I didn’t read this book because of this. I read it because I thought the perspective would be interesting, the war as seen through the eyes of young women. A very poignant piece that I think all young people should read. This entry was posted in Australia, Reading by Cathy Powell. Bookmark the permalink.